A new build, commercial scheme recently built on the banks of the Manchester Ship Canal, in Salford, primarily for the investment. The two acre site is ‘home’ to over 45,000 sq ft of development with associated car parking. 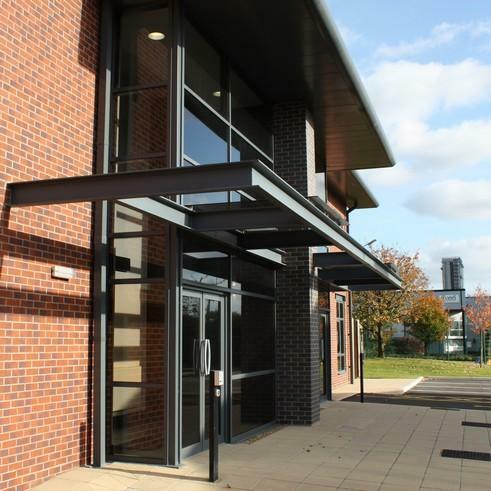 The scheme offers individual, small, front door office accommodation in a two storey format. The design of each unit responded to our clients brief, that net areas offer a range of sizes per floor, incrementally by 500 sq ft between 1,500 sq ft and 4,000 sq ft. This results in the 6 units having the flexibility to be subdivided into 14 self contained offices with shared common areas all at a gross to net efficiency of around 85%, an ideal ‘mix’ for the speculative market.